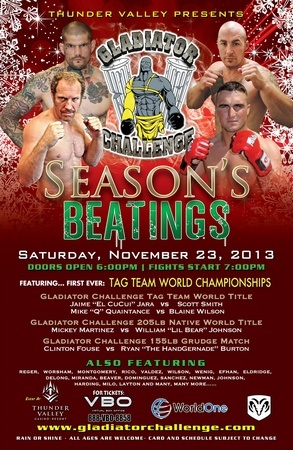 On Saturday, November 23, Gladiator Challenge will be home to the first ever North American MMA Tag-Team fight. The event has been titled “Season’s Beatings” and will be held at the Thunder Valley Resort Casino in Lincoln, California. While details are sparse right now, we do know that the bout is between the teams of Jaime “El Cucui” Jara and Mike Quaintance vs. UFC veteran Scott “Hands of Stone” Smith and Blaine Wilson. Cage Nation TV reached out to Gladiator Challenge (via Facebook) for details and all we’ve been able to decipher to date is that all four fighters will not occupy the cage at a single moment, leading one to believe that in order to “tag in” an opponent, you’d have to tag a designated corner or the cage. We also asked if the California State Athletic Commission were sanctioning the fight, with no response. The Thunder Valley Resort Casino is owned by the United Auburn Indian Community, likely on land where the State Athletic Commission has no jurisdiction. In events before, as long as the tribal government would sanction the fight, the fight would continue. The concept of the tag team fight is novel in North America; however it is not pioneering on the global MMA front. Tag team MMA has been promoted in Japan and is really our only barometer as to how Gladiator Challenge’s November 23rd fight will happen. The promotion that comes to mind, that has really pushed for the promotion of tag team MMA, is ZST (pronounced Zest) out of Japan. We’re including a video with this story, to give you an idea as to what a tag team fight would look like. Gladiator Challenge’s “Season’s Beatings” also includes the bouts of: Mickey Martinez vs. William “Lil’ Bear” Johnson for the GC Light Heavyweight Native American Championship and the Lightweight grudge match between Clinton Fouse and Ryan “The Hand Grenade” Bourton.